The dental crown has been around for generations. Tooth-shaped and custom-fashioned from high-quality porcelain, crowns restore teeth which otherwise would break, fail, and require extraction. Kalamazoo, MI, family dentist Dr. Mark Richardson offers this restorative treatment to his patients. Crafted and fitted to cover remaining healthy enamel a porcelain crown is bonded right onto the tooth. Made according to traditional or digital oral impressions, the crown fits right in with its neighbors and performs the usual functions of biting, chewing, and smiling. It adds a great measure of strength to a weak tooth, and it keeps bacteria from invading the interior pulp chamber. In fact, your Kalamazoo dentist usually finishes root canal therapy (which removes diseased pulp) with a beautiful porcelain crown. Could a crown help you? Only your dentist can answer that question with a complete exam and X-rays in his office. 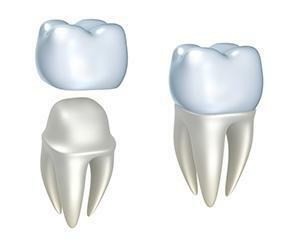 He can use a crown to replace most of the hard tissue, or enamel, above the gum line, or in the case of tooth replacement, Dr. Richardson may recommend two or more crowns to support a multi-tooth bridge. Crowns also top off today's premiere tooth replacement option, lifelike dental implants. When you see Dr. Richardson, you'll discuss your concerns, goals and treatment options so you arrive at a care plan just right for your oral health. It's as easy as brush, floss and be gentle. Yes, as with your completely natural teeth, crowned teeth require regular at-home and in-office hygiene. Keeping the margins of crowns clean stops gum disease. Also, avoid the stresses of teeth clenching with a nighttime mouth guard. Bruxism places severe pressure on natural enamel and porcelain restorations. However, if you are careful with your crowns and other restorations, they should last at least a decade or more. The American Academy of Cosmetic Dentistry praises dental crowns because of how well they replicate natural tooth appearance and function. Plus, crowns preserve as much natural tooth structure as possible, avoiding smile gaps and reduced gum tissue and jaw bone. For more details on crowns and the other restorative, preventive, and cosmetic treatments Dr. Richardson offers, please call his office in Kalamazoo, MI, at (269) 343-6907.